Your Sky 's sky, horizon, and telescope maps show the sky as it appears at the specified time (real or simulated) from the chosen viewpoint. Stars visible to the naked eye and symbols representing the Sun, Moon (with correct phase), and planets are shown in their correct positions in the sky. If you've entered the orbital elements of an asteroid or comet to track and it's currently visible, the symbol representing it will also appear, if within the field of view. The sky map is drawn in the form normally used by astronomers. If you're in the Northern hemisphere, North is up and West is to the right. At first glance, East and West seem backwards, but remember that a sky map represents the dome of the heavens and that you use it (at least in your mind) by holding it over your head. If you stand facing North and hold the map over your head, then East and West on the map correspond to their terrestrial directions. Think about it. If you're observing from the Southern hemisphere, South is up and East is to the right. To invert the map from the default orientation for the observing site, check the “Invert North and South” box in the Display Options section of the sky or telescope control panel. Inverting a horizon view would be equivalent to standing on your head, and since few people do this while stargazing, inversion is not provided in the horizon view control panel. If the default full colour scheme is selected, the background of the sky map and horizon views is blue if the Sun is up, dark red if it's rising or setting, dark blue during twilight (when the Sun is between 18 and 6 degrees below the horizon), and black at night. Planets and stars are shown even if the Sun is up and they aren't actually visible. (When Venus is sufficiently elongated from the Sun and the sky is crystal-clear, with a little effort you can see Venus with the naked eye in broad daylight—the sky map tells you right where to look!). The virtual telescope always shows a black background. The celestial poles are marked with a light blue cross with arms pointing at the 0, 6, 12, and 18 hour marks along the celestial equator. The equator is also drawn in light blue, with labeled tick marks at every hour of right ascension. The ecliptic is plotted in dark red with ticks and labels every 15° of ecliptic longitude. 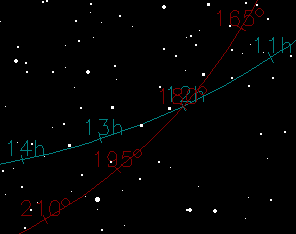 The point where the ecliptic intersects the celestial equator at 0 hours of right ascension and 0° ecliptic longitude is called the “March Equinox” or “First Point of Aries” (even though the equinox hasn't actually occurred at that point in the constellation of Aries for more than 2000 years—it's in Pisces now, and will pass into Aquarius in the year 2597 when the “Age of Aquarius” actually dawns some six hundred years after the rather premature but nonetheless catchy popular song which heralded it). You can turn the coordinate display on and off with the “Ecliptic and equator” check box in the Display Options control panel. To aid in orienting yourself, the names and outlines of the constellations and the borders between the constellations are normally shown in all maps. You can toggle these annotations on and off with the corresponding check boxes in the “Constellations” section of the Display Options panel. 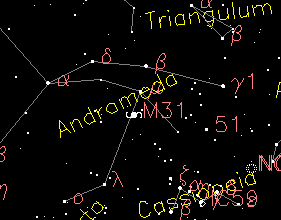 In sky maps, constellation names can be drawn either horizontally or aligned with the nearest horizon. The “aligned with horizon?” check box controls whether this alignment is done. 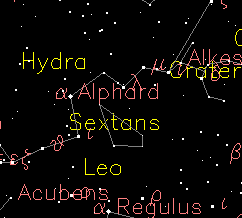 Printed star maps often align constellation names in this way, but you may find aligned names more difficult to read on a computer monitor. Names of bright stars such as Vega, Capella, and Altair are normally shown on the sky map; you can toggle star names on and off with the Star names box in the control panel. Less prominent stars are identified by the Greek (“Bayer”) letter or Flamsteed number within the constellation; you can turn this nomenclature on and off with the Bayer/Flamsteed codes box. 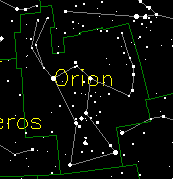 Solar system objects, including the Sun, Moon (in its correct phase), planets, and any asteroid or comet for which you've entered orbital elements are shown in the sky map as symbols at the correct positions in the sky. You can switch display of solar system objects on and off with the “Moon and planets” check box. The technique used to calculate the positions of the planets from Mercury through Neptune is valid only for dates less than A.D. 8000; if you specify a date further in the future, the Moon and planets are not plotted on the map and no ephemeris is shown. Pluto has been observed over an insufficient fraction of its orbit to allow accurate computation of its position outside the range of years from 1885 through 2099; Pluto is not plotted for dates outside this interval. Nonstellar objects from a deep sky database are plotted as labeled icons in the sky map; you can hide or display them with the “Deep sky objects” check box. Only objects brighter than the magnitude specified in the accompanying input field will be shown.